In today's world, everybody seems to be running. Either you are running for your work or taking kids to activities, social gatherings and specially in the beautiful weather of summer it seems there is so much to do in so little time. We all know time never stops. Back in June me and my friends were talking how this long summer break gonna pass and here we are only last little bit of summer break left & I'm thinking where did all the time went. We have been busy with all the summer related activities and parks and water plays are on top of it. When we are busy enjoying summer weather sometime one doesn't get enough time to do cooking, at those moments grabbing a take out seems to be so perfect BUT not if you are well prepared ahead of time. Today I'm gonna share some tips and ideas on how to stay well planned ahead of time so you can keep your family healthy by avoiding junk food and also if this route saves you some money who doesn't want it. I know what you guys are thinking that summer is already at the end and my post is late but I'm sure this post can help you with regular school days also, when again we all are busy but with different kind of activities :) . 1. POPCORN HOMEMADE with REAL BUTTER: who doesn't like popcorn with good buttery flavour. Back in 2011 when I stopped using Microwave kids were really worried and O'course popcorn was one of the concerns. But once they ate stovetop popped popcorns with real butter they never looked back. Recipe is real simple. Take a deep heavy bottom pan(that is must) with lid , I use my 6 qt. stainless steel Dutch oven/chilli pot(whatever the name is but for us it's now popcorn maker :) ). Heat the pan on medium for few seconds add 1 Tablespoon of cooking oil. Carefully swirl it so it coats the bottom of the pan. Add half a cup of the popping corn and using a spoon just mix them so all of the corn kernels get coating of oil. Cover the pot with the lid in a way so it's not tightly closed , leave a little tiny opening(keep the lid little tilted, may be like quarter of an inch any more then that & popcorns might jump outside while popping) so the steam can escape and you get crunchy popcorn and not soggy kind. Now, the Fun begins. after few seconds corn kernels will start to pop. BE CAREFUL DO NOT OPEN THE LID, just enjoy the popping music it gonna take anywhere from 1&1/2 minute to 2 minutes. When the popping music kind of dies no more popping means work is done turn the gas off. In a small pan melt the butter(if using), take the lid of the popcorns & slowly add butter & keep mixing. If using salt also sprinkle that & again mix it. This total procedure should not take more then 5 minutes and you have one wonderful snack ready which can keep anyone happy. To Store : Once cool these can be stored in an airtight container for 3-4 days or better you can make single serving size ziplocs and they are ready to go whenever you are ready to go. 2. HOMEMADE MEATBALLS good enough for snack or as part of the meal : My kids love home made meatballs. They are good for a quick snack or if you like add some pasta and pasta sauce and you got your family a quick healthy meal in very little time yes the only time taken here is the time it takes to boil the pasta given that you already have pasta sauce(sorry no recipe on the blog yet) ready and meatballs also ready in the fridge waiting to be devoured by you and your family. 3. QUICK FRUIT BREADS : I like to bake some sort of fruit bread once a week as they can serve as healthy breakfast option or as a mid meal snack/ goto snack. My kids even like them as a dessert also provided they are given with a scoop of some homemade ice cream or freshly whipped cream. Two of my favourites are Almond & Banana Whole Wheat Cake and this Healthy Banana Bread with Oats and Whole Wheat flour. Yes I do bake these as cake sometime to make it look more interesting. Let me tell you these are very forgiving kind of recipes I use these as base for my many recipes, sometime I add a finely grated zucchini or finely grated carrot. I have also made these with all whole wheat flour, in that case I like to use King Arthur's White Whole Wheat flour as it results in light baked goods. 4. BREAKFAST COOKIES, they got WHOLE GRAINS, ALMONDS, FLAX SEEDS, all the good things you should eat during breakfast : My first grader loves these(Click here for the recipe). Given that she's considered sugar monster in my home it's a good feeling when she asks more of these and I noticed if I'm well stocked with these favourites of her, she's happy when ever sugar urge strikes and I don't mind if she eats 2 or 3 of these. They are also perfect for packing as snack while you or on some road trip. 5. NUTS and DRIED FRUITS : This is one simple snacking option which doesn't need any cooking time, I always keep a small snack size ziploc full of almonds(our new favourites are raw almonds) and another one with dried figs, raisins and dates in my handbag. These come very handy when we go for long walks and hiking and you need to maintain your energy level so instead of depending upon some candy bars why not get some natural sugars in the simple form. 6. 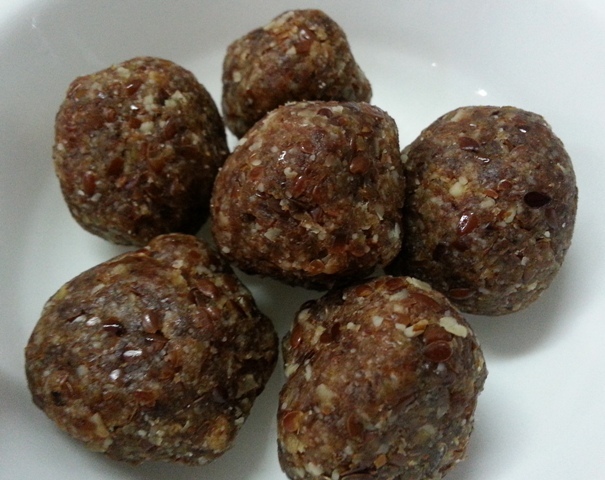 ENERGY BALLS : This is the variation of above option only. It need roughly 10 minutes of your time to prepare this wonderful healthy snack full of natural sugars and other nutrients. To make these take around 30 dates, roughly chop them & keep aside. Now put around 1&1/2 cup of almonds(preferably raw) in a food processor, also add half a cup of dry roasted Flaxseeds. Process these keep it little coarse, now add chopped dates & again process them for few seconds. Once everything comes together like a ball, take it out of the processor and make small balls out of it. Store in a airtight container. These are the few food options which I rely on quite often. Specially the days when we are busy and as a mom I don't want to always say no to snack but at the same time I don't want my kids to eat junk & unhealthy food. So little planning & we all are happy. I'm really sorry that I don't have pics for all the above options as I don't have access to my computer. Once I have access to my computer I'll update the post with the pics. 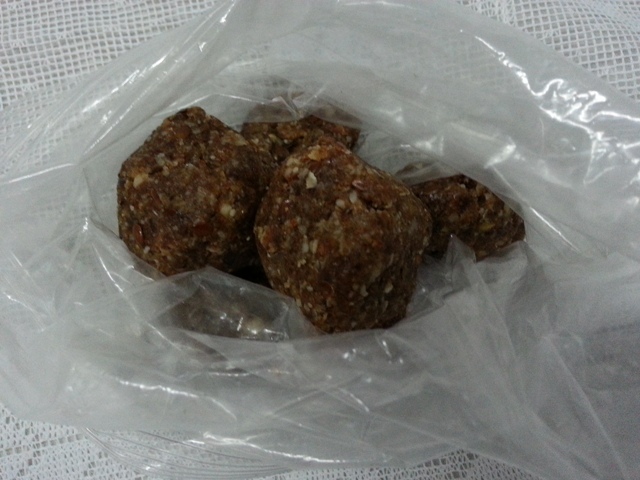 The only pic I have right now is of Energy balls, because while travelling I'm carrying those. I did had Breakfast cookies too but those finished before I expected. Enjoy the rest of the summer and for more healthy snacking options you can also check this page on nuts.com .